Nintendo will be shipping around 1.8 million Wii consoles in November and December. But it still won't be enough to satisfy the global hunger for Wii Sports and Super Mario Galaxy. "We had to make our final decision on how much to produce each month for the holidays back in the summer," Nintendo of America's marketing chief George Harrison told Next Generation. We've already reported on the shortage of Wii consoles in the run up to Christmas this year. Another visit to Wiipreorder.co.uk this morning showed no stock available in any of its featured stores. It seems that Nintendo underestimated the popularity of the Wii this year - a situation that the Japanese company can't remedy quickly. "It takes about five months for us to increase the actual monthly rate of production," said George Harrison. "We're at a rate now worldwide of about 1.8 million Wiis produced every month... It's almost an embarrassment of opportunity in terms of where to place those Wii hardware units." Harrison explained how its Wii consoles generally come into the US by boat from China. The journey takes 10 days and it then itakes another 10 days to get the Wiis unloaded and shipped out to store shelves. With Wii consoles difficult to come by, there's still time to turn to the technology black market we all know as eBay. Prices for Wii consoles on their own are currently hovering around the £190-£220 mark in the UK. The console usually sells for £179. But as November gives way to December, expect demand to increase for second-hand Wii consoles and prices to rise. Online stores such as Amazon UK and Play.com are making the most of any stock they have by selling £300 Wii bundles. 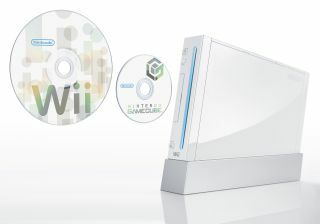 Desperate last minute shoppers could ultimately be forced to pay £400-£600 for a Wii on eBay. With Nintendo's five-month manufacturing lead time, there's a strong chance that it won't have increased its production numbers. Especially, if Nintendo anticipates Wii fever cooling in early 2008. "It'll probably slow down sometime in January," suggests George Harrison. "But what really surprised us in 2007 was that the holiday sales after the launch of Wii didn't slow down in February or March. What caused us to fall behind was supply."